Macaroni & cheese is one of those dishes that is very hard to replace on a WFPB diet. There aren’t any cheese substitutes I can eat (too processed, usually contains something-or-other I’m supposed to avoid), so, like any “normal” dish with cheese, I have a hard time adapting the flavor and consistency using ingredients I can have. I’ve only tried a couple other macaroni recipes (one of which was very “meh” and the other was just gross) before I found the one from PlantPure Nation and ceased looking for macaroni recipes altogether. The PlantPure recipe does not, of course, taste exactly like regular macaroni and cheese. It’s like trying to recreate a grilled cheese sandwich or stuffed-crust cheese pizza as a WFPB version. It is not going to happen. So don’t get your hopes up that this is the be-all-end-all replacement for macaroni! Having said that, I still think it tastes great, and it relieves my occasional itch for macaroni and cheese. If you prefer plain macaroni and cheese and don’t want any add-ins, you may not enjoy the plain version of this recipe. I think the peas, beans, or whatever you add are essential for giving this recipe a good flavor and texture; though, I’ve never tried it plain (because I think it sounds super boring and not-macaroni-and-cheese), so you are welcome to give it a shot and see what you think. Servings: 6 servings-ish. Enough for 2 hungry adults and plenty of leftovers! Preheat oven to 350°F. Put all ingredients up to macaroni noodles (squash through pepper) in a blender. Blend until it’s as smooth and creamy as you can make it. 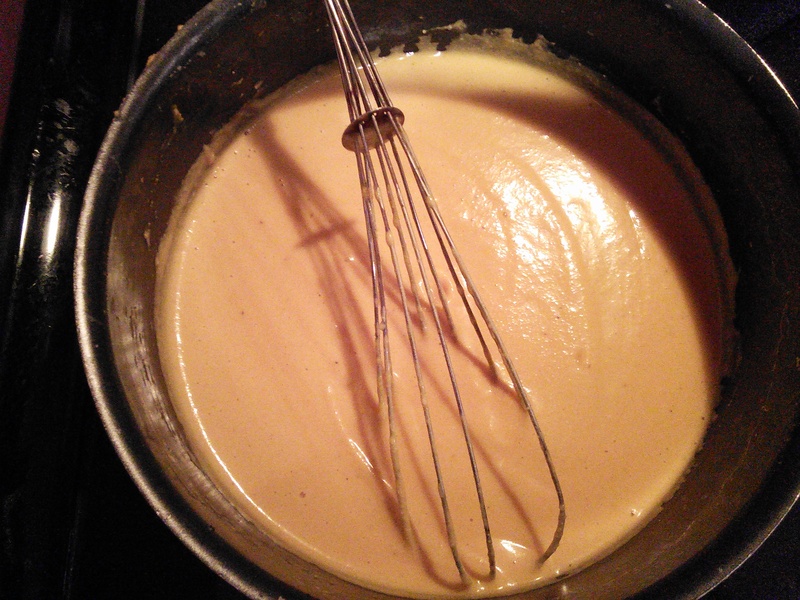 Dump the mix into a saucepan over medium heat and whisk until it thickens up a bit. Bad lighting. It’s a yellow color, not orange. Cook the pasta noodles (rice or wheat) according to package directions. Combine the noodles, sauce, and any of the optional toppings you’re adding. Bake, uncovered, for 20-30 minutes or until it’s golden brown and a bit bubbly. Enjoy!